The developers at Ainsworth Games Technology have been releasing exciting online slots over the recent months for players to enjoy both in free play and real money. Cash Hound is one of the release titles of February 2018 that comes with decent jackpot prizes and free games. One of the reason's for this slot's popularity is because it focuses on the man's best friend. Cash Hound slot is played with 5 reels, 3 rows and 30 fixed pay lines which reward from the leftmost to the rightmost. Expect to find a wide range of bonus features, medium volatility and friendly theoretical return to player of 94.04%. Also, the graphics and animations are superb, accompanied great sound effects and flawless gameplay. Whats unique in Cash Hound slot are the two different free spins that will boost your chances of winning. As if that is not enough, you will enjoy a bet range of between $0.06 up to $24 per spin and a maximum payout of $25000 from a single spin. Take a trip to the farm and enjoy everything the crowded cities have been denying you and stand a chance of hitting one of the jackpots. Produced by one of the most reputable developers, Ainsworth, you can choose to play Cash Hound on Android and iOS-powered smartphones and tablets. Continue reading our review to learn how you can hit one of the jackpots in this thrilling video slot. If you have played any games from Ainsworth developers, then you know that they live to their word. Their games are packed with appealing visuals of 3D graphics and a smooth play, and this is what you experience when you play Cash Hound slot. The background is catchy with a huge green tree and rolled hay on the left and a windmill and the entrance to the farm's residence to the right on the screen. 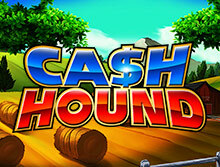 Cash Hound slot will take you to a stunning landscape screen upon loading. The reels are in a golden frame with paw marks on the corner of the screen, and they have a range of symbols with the Hound being present. Some of the characters you will find on the reels include all the farmyard animals including cows, pigs, chickens, and rabbits. You will also see the standard deck card playing symbols running from A to 9. As with other slots from Ainsworth, there is minimal background music, only a couple of sound effects when the reels stop and when you land matching symbols. The rules of playing Cash Hound slot are identical both in real money mode and trial version. You must land matching symbols on the reels to unlock your prize. Wagering starts from a little as $0.02 up to a maximum of $0.60 per line, but this can go up to $24 with a possible payout of $250,000 max prize. It is important to adjust your wager first before you take your trip to the farmyard. All the game settings and bet options are located at the bottom after the reels. By clicking on the cog icon, you will be directed to the game's main menu. Click on the (+/-) signs on the bottom menu bar to set the amount you would like to play. Use the Spin button in the bottom left corner to start the reels; this setting will become the Stop button when the reels are in motion. With the Auto Spin button, represented by the (+) icon next to the Spin, you will be able to play up to 100 auto games. There are different symbols used in Cash Hound video slot. The fine themed icons such as the cat, pig, dog, and the chicken mark the high paying symbols while the standard card symbols represented by J, K, Q, A, 10 and 9 are the low-value symbols. The highest paying symbol to watch out is the chicken which can reward you double the Total Bet in the base game for landing 5 on a payline. The Golden Hound represents the Wild symbol in the game and can land on reel 3 only and replace for the Hound symbol only. You will be rewarded whenever the Golden Hound appears in a win line and the wins multiplied by the 2(X). The scatter symbol is represented by the Golden Bone symbol in the game. Landing 3, 4 or 5 of the golden bone scatter symbols will reward you 3, 10 or 50 times your initial wager. The scatter is also responsible for activating the bonus features. By landing three or more Golden Bone scattered symbols, you will 10 free games. The wild bone will showcase during this feature to substitute for all symbols except the Hound Head, X2 and X3 symbols. Whenever a Hound Head showcases on reel 1, a Bonus Reel with bonus symbols X2 or X3 will show up and all symbols appearing on either the first 3, 4or 5 reels that are determined randomly will be transformed to Hound Head except the Golden Bone which turns into Wild Bone. Also, the Hound Head symbols will be replaced at random by any other symbols except the scatters and hounds. When the Crazy Feature is activated, you will receive six free spins. The Hound replaces for all symbols except the Scatters, bonus symbols, and Hound Head. Beginning from the 6th free game, the Bonus Reel with bonus symbols X2, X3, X2 Re-Spin, and X3 Re-Spin is activated. An extra free game will be rewarded whenever X2 Re-Spin or X3 Re-Spin shows up on the bonus reel. The Bonus Spin feature is activated when the Hound showcases in all positions on reels 1 and 2, but when the Grand or Major bonus prizes are paid out. 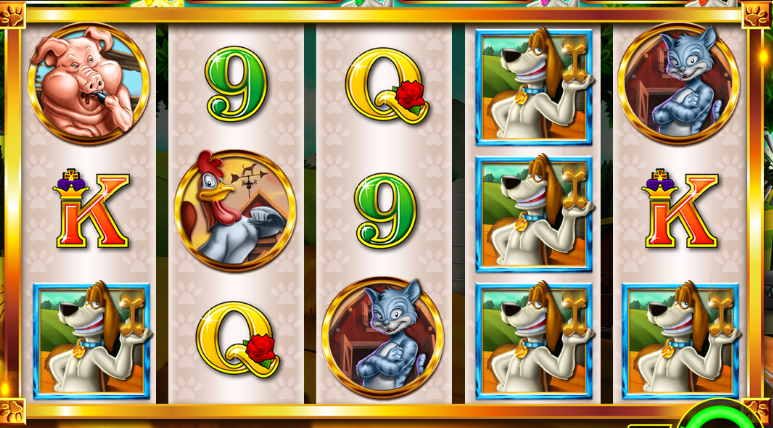 All the reels in the game which activated the bonus spin are respun once only except the reels with the Hound or Golden Hound showing up in all positions. You will also have a chance of landing on of the five jackpot prizes. However, the paytable will differ in each free spins round from the base game. Play Cash Hound Slot on The Go! You can play Cash Hound slot on all mobile and tablet devices powered by iOS and Android. Ainsworth slots are built with latest HTML5 technology which enables them to feature top-notch graphics and seamless gameplay with no download. The game is available in instant mode, meaning you can play it directly via any mobile browser like Chrome, Opera, Safari and Firefox. For more than 20 years, Ainsworth Games Technology company has been producing high-end products on the online market. Founded by the leading developer, Len Ainsworth, their games are not only appealing but offer the best gaming experience. Even though most of the first games were created for the land-based operators, you can play their unique online version at any site powered by their software. This was made possible by their A600 platform that was built in 2015, where you can access a vast collection of their games. Their games come with different bonus features like the wilds, free spins, multiplier and scatter to boost your chances of winning. Cash Hound slot and many other video slots from Ainsworth Games Technology are available in our game lobby. bCasino is one of the latest operators in the London market, having been launched in early 2018. We are licensed and regulated by the UK Gambling Commission (UKGC), one of the most reputable companies in the world. Our rich game portfolio is supplied by some of the best developers including NetEnt, Playtech, Evolution Gaming, Thunderkick, Play n Go and Playson among many others. We have the best bonus offers which include up to $1200 welcome bonus plus 100 free spins to all new players a who deposit a minimum of $20 and additional promotional offers to keep ensure that you dont miss out any game. You will be lost for choice with our multiple and secure deposit and withdrawal options such as Mastercard, Maestro, Visa, Neteller, and Skrill. Our highly trained customer support team will ensure that all your questions are answered via email and live chat 24/7.